After half a lifetime of searching, Barry encounters the man who killed his mother - a man in a yellow suit with speed that surpasses his own! Cisco and Dr. Wells think they can help catch the killer, but only with the help of Detective West and a tachyon device from their rival, Mercury Labs. Meanwhile, Eddie Thawne asks Iris a big question and Caitlin discovers that her fiancee, Ronnie Raymond, is still alive and in possession of metahuman powers! The Flash: Rebirth (the concept of Barry Allen's worst enemy killing his mother) and The Flash #139 (the introduction of The Reverse Flash). Carlos Valdes - usually the plucky comic relief as Cisco Ramon - gets a number of quieter moments here where he shows that while he may have been cast in this role for his comedic timing, he can handle the serious, softer drama as well. We see this both in his wordless reaction to Caitlin's heart breaking as she talks about how she regrets the "one more minute" she got with the love of her life and his quite talk with Joe West about a second speedster being there when Barry's mother was murdered. 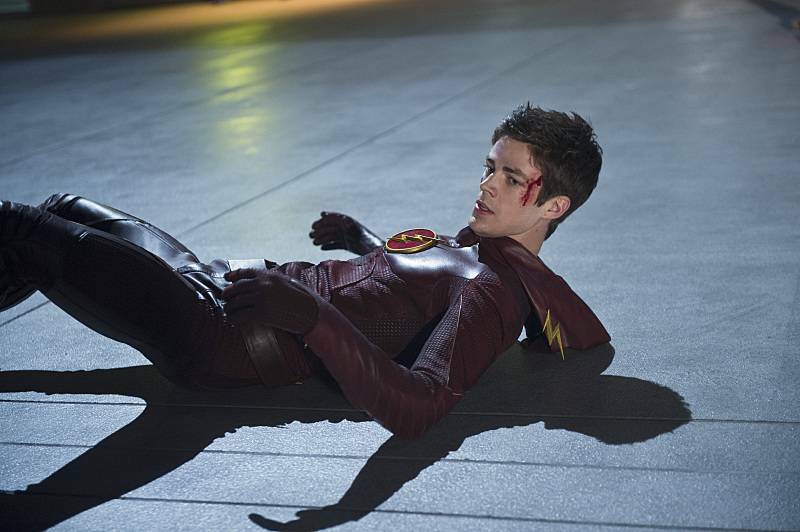 The opening chase scene with Barry chasing after The Reverse Flash. In the comics, the Reverse Flash (aka Professor Zoom) was a man named Eobard Thawne. Thawne was born in the 25th century and a major Flash fanboy. So much so that he had plastic surgery to make himself look like Barry Allen (whose secret identity was known by that time) and spent his family fortune trying to replicate the accident that gave Barry his powers so he could go back in time and fight alongside his hero. Thawne was successful, save that he miscalculated how far he needed to go back and he arrived just a few years after Barry Allen's death. Once there, he discovered - through a display in the Flash Museum - that Barry Allen was attacked by a villain whose name was unknown to the historians of his time - a man named Eobard Thawne. Faced with the idea that he was destined to become an enemy of the man he admired most, Thawne went crazy and evil. In the comics, Tina McGee was a college student, majoring in nutrition, who received a grant to study Wally West's metabolism. The two dated for a time but remained close friends after their break-up. Tina eventually became the head of STAR Labs Central City branch and assisted Wally with a number of cases. Tina McGee was also the name of the female lead on the 1990's The Flash TV series. There, she was a STAR Labs scientist who helped Barry Allen with understanding and controlling his powers. She was played by actress Amanda Pays, who also plays Tina McGee in the current The Flash show. The new version of Tina McGee's full name is Christina McGee. She's the head of Mercury Labs, which was STAR Labs biggest rival until the night of the particle accelerator explosion. She has a dislike for Harrison Wells which seems to go beyond professional rivalry and she compares Barry to Harrison unfavorably after Barry threatens to send the professional scientific journals after her digging for information on her latest projects when she refuses to let the police borrow her technology as bait for a trap for The Reverse Flash. Mercury Labs is named after Mercury - the messenger of the Roman Gods, who was said to possess amazing speed. The common artistic depictions of Mercury inspired the costume of the first Flash, Jay Garrick. Many mythological scholars have correlated the legends of Mercury to modern superhero comics starring The Flash. In his Firestorm form, Ronnie Raymond's eyes glow white - just like in the comics. As in the comics, Firestorm is capable of flight. The ring that Wells uses to open his secret room has a The Flash insignia. In the comics, Barry Allen used such a ring to hide his costume, which he kept folded up VERY tightly within a secret compartment in the ring. When he needed to change into The Flash, he could just open the ring and have the costume spring out so he could change into it unseen at super-speed. The Reverse Flash tries to rob the Superluminal Development Lab at Mercury Labs. Superluminal is the scientific term for "faster than light". It is used in reference to superluminal motion - the idea that some objects (particularly radio galaxies and quasars) are capable of moving faster than the speed of light - and superluminal communication, which theorizes that we might be able to transmit electronic information at speeds faster than light. Barry notes that the blood-splatter pattern found at Mercury Labs is consistent with that in a high-speed collision. Tachyons are theoretical particles capable of faster-than-light travel. Although their existence has yet to be proven, their theoretical effects play a major role in defining modern physics. Tachyons are routinely referenced in modern science-fiction as the key to time travel, Dr. Wells states that tachyons could be used to make a person capable of faster-than-light travel and could well render a person invincible. The trap for The Reverse Flash creates an electronic barrier using super-capacitors. Cisco is able to track Ronnie by following a trail of ionized particles he leaves in his wake with a meter that measures the radiation emitted in counts per minute (CPMs). The CPMs increase the closer they get to Ronnie. Nora: If I turn this light off now, would you be scared? Nora: That's because I'm here with you. See, you're not afraid of the dark, Barry. You're afraid of being alone in the dark. And that goes away when you realize something. You're never really alone. Barry: It was you! You were the one in my house that night! You killed my mother! Why?! The Reverse Flash: If you want to know that, you're going to have to catch me. The Reverse Flash: It is your destiny to lose to me, Flash. Just as it was your mother's destiny to die that night. Dr. Wells: The reason I know all this is because your powers are almost exactly the same as The Flash! The Reverse Flash: Well, I'm not like The Flash at all. Some would say I'm the reverse. Joe: When you first moved in with us, I thought it was going to be too much. I was already a single dad. Finances were tough. And you were a little boy who just lost his mother. But,man, I was wrong. Within two weeks you changed the whole dynamic of the house. Suddenly the house was filled with this light, this energy. I mean, you brightened up everything. You've seen more darkness than any man will in a lifetime and you never let it dim your soul. So there I was thinking that I'm changing your life by taking you in, but the truth is you changed mine. So don't lose that light, now, Bar. The world may need The Flash, but I need my Barry Allen. Joe: You're too close to this! Barry: Well maybe you're not close enough! Barry's Christmas gift to Iris is a replica of her mother's wedding bands, which Iris lost while on a field trip in 5th Grad. She gets him a new microscope. Grandma Esther West has a famous eggnog recipe with a liberal definition of what "light on the bourbon" means. Eddie asks Iris to move in with him. Dr. Wells has a deep hatred of Stephen Hawking. Joe tells Barry about being attacked by The Man In The Yellow Suit back in F106. The figure not only threatened Iris' life but also stole all the evidence in Nora Allen's case file. Barry was afraid of the dark as a child or- according to his mother - being alone. Barry confesses his love to Iris, who says nothing in response, though she does cry a little. The field fails to contain The Reverse Flash. At least, he is able to pull Wells into the field and deliver a beating to him. Firestorm tells Caitlin not to look for him again. Joe tells Eddie about the existence of metahumans and that he knows who The Flash is, but that The Flash saved their lives. Dr. Wells promises Caitlin they will bring Ronnie home. Barry has a snow -globe of Tower Bridge in London, that belonged to his mom. She got it while she was traveling Europe after college. Cisco figures out - based on Barry's memories of the night his mother was killed - that there must have been two speedsters present: The Man In The Yellow Suit and another one. Dr. Wells has a ring with a Flash insignia that is used to open a second closet in his secret closet. This closet contains The Reverse Flash costume . At the end of the episode, he fits the costume with a harness utilizing the tachyon device from Mercury Labs. There is a painful attempt to try and pair up the series' only two female characters for a scene in order to pass the Bechdel Test. Too bad the only thing Iris and Caitlin have in common to talk about together is Barry Allen and Iris's blog entries on The Burning Man. A fitting mid-season conclusion that advances all the major plot-lines without really resolving any of them. Just when we think we have the answers, we're left with more questions. And that is as it should be in both science and in science fiction.